It's 63 degrees, overcast and rainy in New York City and that makes me smile inside. Working in the Wall Street area keeps New York City streets swamped with tourists, but when it rains... ahhhh the ability to walk a straight line and not have to maneuver around obstacle courses (a/k/a tourists). Another thing that makes me smile inside is chilly weather + rain = boots... Yeah.... its boot season. 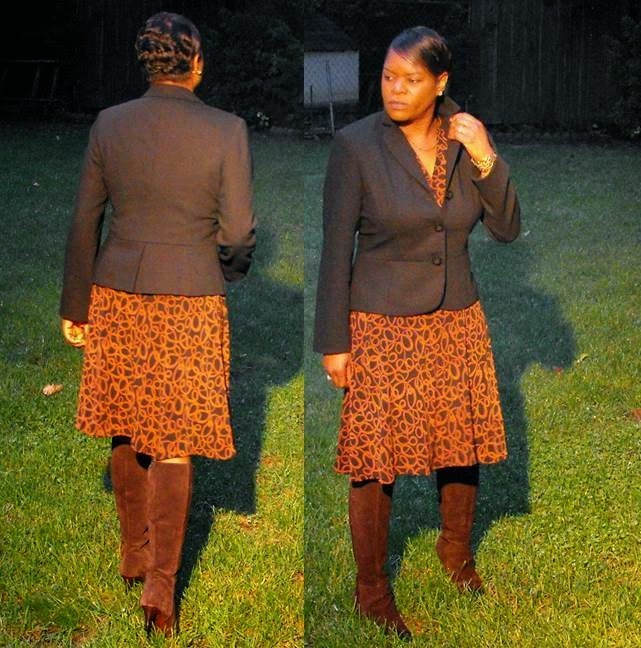 I donned an old time favorite, Butterick 4976 made back in 2009 with Loft brown suede boots... yes on a rainy day... just spray Scotchguard water protectant and ya' good. Last year I decided to wear it in the Summer and in came a lil refashion and shortened the sleeves. This is another slip on and go dress and has held up well to machine washing over the last 5 years. The perfect dress for pairing with tall boots and a blazer on a chilly & dismal day. That dress looks wonderful, Sheila! Love it! Thank you Mimi, its such a comfortable dress. Thank you Syl. Hoping you had a great time in NY last summer. Lol... that's how we identify tourists by the baffle look and walking too slow...lol. That Sheila...(talking about you) she will hook up an outfit with a jacket in a minute...love that dress with that jacket!!! Thank you Terri. Lol..my wardrobe revolves around blazers. Haha. My wardrobe revolves around blazers too. Your remakes get better and better. Rock it! Thanks L. My family call me Linus everytime they see me with a blazer a/k/a blanket...lol. One reason why I am trying to add more weekend pieces to my wardrobe.